Warning: State values are used by components according to their position in the list of values, and not by their names. Therefore, renaming a value will not change the behavior your design. However, if you re-order or delete values, the behavior of your design will change or break. Clicking the edit button opens the state inspector dialog. 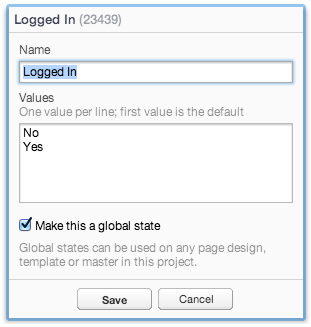 Using this dialog, you can rename the state and add, remove or rename its values. After editing the state you should test its behavior. Refer to Testing States for more information. The State Listing includes options to Clean Up and Merge States. 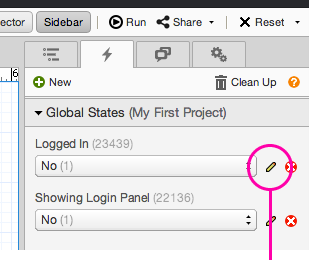 The Clean Up option will automatically delete any states that are not used by any component on the design. The Merge States option will merge all local states on a design. This will take all exact duplicate states, those with the exact same name and values, and combine them. All components that use these states will be changed to point to the surviving single state.